The blog of the Mora Hiking Club includes articles from its members covering wide scope of interests of the Club. This includes personal experience and opinions of individual members and the formal activities of the club as well. - Take raincoats, umbrellas and leech repellent. Gradually we were coming to the end of 2017/2018 hiking calendar, Mora Hiking Club. Peacock Hill was the next to last hike which was scheduled on 13th May, 2018. We arranged a bus from University entrance and started the journey around 2.30am which took four hours to reach Mawanella. We had our breakfast in Mawanella; we divided into few groups and went to several shops, so we could to save time. Again we started the journey and reached Pussellawa around 10.30am. Lunch packets were passed around by The Organizing Committee, and emphasized the importance of bringing back our wastes. Before beginning the hike, all the hikers gathered around and discussed about the mountain, height, area, and what are the things we can see at the peak. 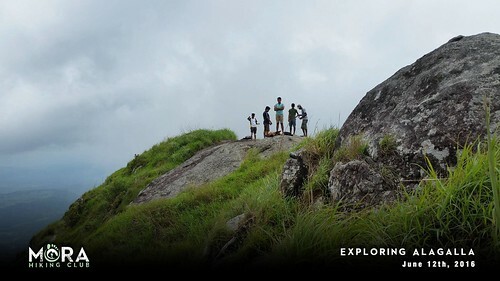 Peacock Hill; commonly known as Monaragala (මොනරගල) is one of the most beautiful hikes, which can be completed within a single day, without feeling tired. When you see the name, you may feel that this is another mountain in Uva Province, because name itself says Monaragala. This specific mountain is situated in Kotmale, on the side of A5 road, closer to northern margin of the area; Pussellawa town. Peacock hill Mountain is the highest peak in Pussellawa - Sri Lanka (1518 meters above sea level), rising only 200 meters above the Pussellawa city. It is easily accessible by using the roads across the villages. Peacock Hill is possessing a historical background as well. This village is a turning point when it’s come to Prince Gemunu’s life story, because he had spent 12 years of his life in this village; Kotmale. It is believed that Prince Gemunu (Later King Dutugemunu; is one of the most well-known kings in the history of Sri Lanka, and even today, is much loved by the country’s populace for having united the country of yore.) stayed in hiding in after fleeing to Kothmale following his disagreement with his father. And also, it is said that he stayed in that village as a farmer and a herdsman where he used to go to Peacock Hill with his poultry. The first part of the hike was quite easy since we were walking along the pathway of the tea estate. Some of the members suggested to go through the tea estate where the route is shorter, but difficult. Then the workers of tea estate advised us to not to select that due to leeches. But again the hike began to be bit difficult since we had to go through an area where Pines are grown. Most of the hikers suffered due to leech bites,but we did not stop the journey; otherwise we have to face more leech bites. When we almost reached the peak (transmission towers were just beyond about 60m) it began to rain and the entire area was misty and we could see nothing. We had to wait more than 30 minutes on the peak to get a clear view of the entire area. The funny fact was, when one side is clear, another side was misty and difficult to see through. Peacock Hill Mountain is one of the most panoramic vantage points of Pussellawa which gives an extraordinary view of the most mountains and cities around where you could feel the beauty of Gampola town, Pussellawa town, Ambuluwawa, Dolosbage mountain range, Nawalapitiya town, Nuwara-Eliya town, Pidurutalagala range, Kotmale reservoir & Bible rock. Communication towers have occupied the peak of this mountain but viewpoint provides fantastic surrounding view. It’s not necessary to getting permission to reach the top of the mountain through where the transmission towers are placed. A traveler/ hiker would have a wonderful time walking up the hill in the midst of the immaculate Pussellawa atmosphere. We had our lunch at the peak of the mountain, what made the lunch tastier. I must insist that, you are really lucky if you have gotten that experience at least one time in your life time. Then we took photos and identified various mountains which were clearly seen to the peak. We spent more than two hours at the peak and did not forget to collect all garbage into bags before came back. Although most of the beautiful areas are polluted in Sri Lanka, Peacock hill is still not polluted to that extent. True that, we are travelling and enjoying; but if we leave waste scattered area behind us, it’s not just the pollution ; indirectly we are grabbing the opportunity of our future generation. Whatever the thing we do to our Mother Nature today, the consequences of those activities should be carried by our youngers. Person’s attitude towards the nature, shows how he was raised. Protecting these areas not just the responsibility, we should be accountable for our lifestyles. Hawagala ; a hike to remember..
As usual, the members of Mora Hiking club gathered in front of the University main gate at about 3:30 a.m. and took off to Hawagala on the bus we had hired. We reached Balangoda, had the breakfast there and headed to the University of Sabaragamuwa to collect our lunch packets. Then we came back towards Balangoda and took the road towards Udagalagama to reach the mountain. It was about 10 O'clock when we reached Udagalagama as we had to wait until the breakfast was prepared and wait some time to collect the lunch packets as well. 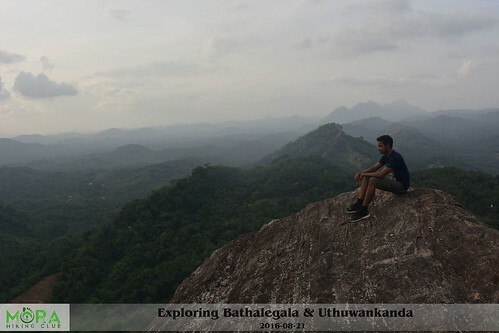 Read more: Hawagala ; a hike to remember..
Take time and think a moment! The event 'Sri Páde 2017' was a Sri Pada Visit and a Cleanup Project organised by the YBA (Young Biologists' Association) and the Leo Club of Colombo Knights for the 5th consecutive year on 18th and 19th of March, 2017. Forestry and Environmental Science Society, Mora Hiking Club and Nature team – UoM were the supportive teams for the programme. A group of 135 representing different organisations universities, clubs joined event. Organising Committee decided to enter the sacred Sri Pada through Ratnapura - Palabaddala route and to descend via the Hatton - Nallathanniya route on the day following. Ratnapura - Palabaddala route is considered the most historic route and the longest compared to the alternative trail. After taking the lunch we started climbing the sacred Sri Pada. It was partly a field visit to explore biodiversity and the route was unarguably an excellent choice for nature lovers. Sri Pada is one of the prime biodiversity hot-spots in the country with the highest number of endemics such as insects, birds, amphibians and reptiles. Also it commands a striking position in Sri Lanka's rich physical geography, morphology, culture and one of the best documented mountains in South Asia. Due to the unique biodiversity the sacred Sri Pada was declared a UNESCOWorld Heritage site in 2010. Walking miles and miles for no other reason than to witness the accumulation of trees and meadows, mountains and waterfalls, streams and rocks, rivers and grasses, sunrises and sunsets. Yeah that’s what we call “Hiking”. And that’s what we hikers are proud of. The experience is powerful and fundamental. It helps to increase fitness and hiking is easier to our ankles and knees compared to running. Hiking gives your body an overall workout. Especially it helps to work the lower body and if carrying a backpack it helps to strengthen the endurance of the upper body as well. Main benefit of hiking is that working and interacting with the large hiking community, encourages you to engage with your workout as a lifestyle. You always meet new people. Stridian என்பதன் இலக்கிய ரீதியான கருத்தாவது மிக நீண்ட பயணத்தின் முதல் படியாகும். இதுவே எமது சங்கத்தினால் முதன் முதலாக முன்வைக்கப்பட்ட மிகப்பெரிய அளவிலான பயணம். அத்தோடு இது மாபெரும் முக்கிய நிகழ்வென்பதிலும் எவ்வித ஐயமும் இல்லை. இந்த நிகழ்விற்கான முக்கிய அடித்தளமாக அமைந்தது; சில மாதங்களுக்கு முன் பேராதனை பல்கலைக்கழகத்தின் explorers சங்கத்தினால் எடுத்து நடாத்திய PERA campus என்னும் நடைப்பயண போட்டி ஆகும். இப்போட்டியில் பங்கு பற்றிய எமது பல்கலைக்கழக மணவர்களினால் அவர்கள் அந்நடைப்பயணத்தின் போது எதிர்கொண்ட பல சவால்களையும், அனுபவங்களையும் எமது mora hiking சங்க உறுப்பினர்களுடன் பரிமாறிக்கொண்ட வேளையில் எமக்கு இவ்வாறான நிகழ்வு ஒன்றை எடுத்து நடத்த வேண்டும் எனும் எண்ணமும் ஆசையும் ஏற்பட்டது. இதன் விளைவாக குளிர்மை நிறைந்த மார்கழி மாதத்தின் 11 ஆம் 12ஆம் திகதிகழில் இந்நிகழ்வு நிஜமானது. Stridian எனும் பெயரைக்கொண்ட இந் நடைப்பயணமானது மிகச்சிறிய குழுவினால் மிகக்குறுகிய கால நேரத்தினால் வெற்றிகரமாக எடுத்து நடாத்தப்பட்ட நிகழ்வாகும். Stridian போட்டியை எடுத்து நடத்துவதற்கு முன்பாக செய்ய வேண்டிய முன்னாயத்தங்கள் பெரிய அளவில் காணப்பட்டது. The hills and valleys are the biggest mysteries on Earth. Since our childhood, we have heard many legends about scared mountain peaks and how our ancestrals worship them. But, life is not all imagining of legends and believing mysteries. It is about to explore and discover the mysteries. Hiking or Hill Walking is for ones who have the thirsty of exploring and discovering. It is a challenge which challenges your limits. And it is a passion for the ones who are crazy enough to accept the challenge. 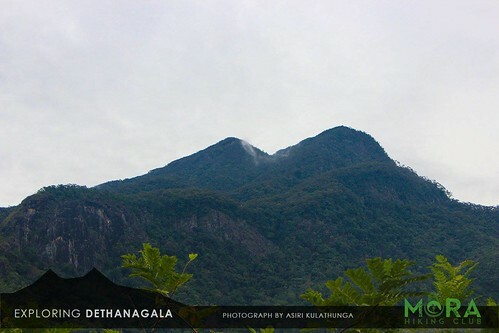 Dethanagala is a two peaked mountain ( higher peak of 1858m and shorter one of 1837m) located at the boundary of Samanala range and Horton plains. It is named such because it is like a breast of a woman as seen from far, having the best angle of view from the town of Balangoda. The known hiking route to go to the peak is in the south side of the mountain, starting from the Dethanagala village. We; 43 members of the Hiking club of University of Moratuwa gathered at the front gate at about 3:30 a.m and took the bus in we hired to the town of Balangoda, where we had the breakfast and collected the lunch packets. Then we took the route to Dethanagala village via Pinnawala and Marathanna. The bus ride was kind of scary as the road was so narrow, just having the width of about the width of a regular van. But the bus driver managed to take us to the Dethangala village safely. The amaze of Sri Lanka is not there only because of its environmental beauty. The hidden stories and the bewildering chronicles advances the beauty of the country in a much astonishing manner. Out of most of the chronicles found about Sri Lanka, the hill country is heavily covered based on the stories of King Rawana. Rawana Ella (waterfall), Rawana Cave and mini Adam’s Peak are key tourist destinations which attract many people simply due to the breath-taking views sand also the underlying historical stories. We started our journey to visit the Ella Rock, Rawana cave and Lipton Seat with a proper plan for two days’ journey. As we took the Podi Manike train from Colombo Fort at 8.30, the number of incredible views we came across in the upcountry train till Badulla is uncountable. If I am to write the actual feelings of embracing nature, these pages will not be sufficient to turn my thoughts in to words. Apparently, it is an impossible task as there are no enough words to describe the true beauty of mother nature we see during the journey via the hill country train route. The places such as Ambewela, NanuOya, Ohiya, Demodara, Nine Arch Bridge, and Great Western increased the beauty of the route to a heavenly level. The train reached Badulla at around 7.30 in the night. We spent the night that day at a rest house in front of the Muthiyanngala Raja Maha Viharaya. Even though that night was extremely cold, we embraced precious sleep with real excitement about the next day hike on Ella Rock.